A charter school is a school that is privately operated, but publicly funded. We are completely free and accept all students (if there is room) onto our campus. We are a nonprofit with 501(c) (3) status. Does it cost money to attend CASA Academy? No. CASA Academy has no tuition and is free to all students. College. Achievement. Social Responsibility. Authenticity. What is the school calendar and what hours do CASA scholars attend school? The school year generally runs from the beginning of August to the end of May. CASA scholars attend school from 7:35 AM to 3:30 PM, Monday through Friday. On Thursday, CASA has an early release at 12:45 PM for teacher professional development. Does CASA offer a full day kindergarten program? Yes, from 7:35 AM to 3:30 PM, Monday through Friday. On Thursday, CASA has an early release at 12:45 PM for teacher professional development. What grades does CASA Academy serve? 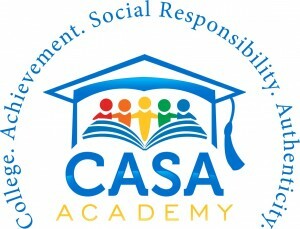 CASA Academy serves students in grades kindergarten through second grade. How does CASA Academy compare to other schools in the region? Where will my child attend school when he/she finishes second grade? CASA Academy works in partnership with Empower College Preparatory, a top school in Central Phoenix. Where can my older children attend school? Does CASA Academy provide transportation? Yes, CASA Academy provides school buses for its scholars. It shares these buses with Empower College Preparatory.